Custom details and specifications and ongoing maintenance of the highest order make COFRESI’S CHILD a truly special one-owner boat. Designed by Chuck Paine (C.W. Paine Yacht Design of Camden, Maine), the boat has time-honored lines and a feel that are virtually impossible to find in a sailboat as young as COFRESI’S CHILD. Below decks, COFRESI’S CHILD’s fit, finish and detail are outstanding. Joinery is crafted with solid varnished teak, not teak plywood veneers. Doors and drawer faces are raised-panel solid teak with custom quality hardware, and lockers have teak doors or panels with louvers for ventilation. Overhead hatches are framed in solid teak and have hinged drop-down screens framed in varnished teak. Cabin trunk ports are opening and fabricated in stainless steel -- even the screens are stainless. Add the boat’s solid teak and holly varnished cabin sole and you start to get the picture. Leaving the cockpit and descending the companionway steps into the galley area, you know all the more that you are now aboard a boat that is indeed special. COFRESI’S CHILD’s layout provides fore and aft sleeping cabins, a main salon with a truly generous galley and thoughtful custom provisions for storage space throughout, that few sailing vessels of her size can claim. The owner’s stateroom is forward and features a queen-sized berth on center. The cabin is lined with louvered opening lockers on both sides and has storage lockers with shelves to starboard. There is access to a divided chain locker forward and stowage below the berth that can be accessed from both a vertical locker door mounted on the front face of the berth, as well as from above, through a large hatch. Just aft of the forward cabin and to port is the head. Head includes a separate shower stall with built-in teak bench and teak sole grating. Sink is porcelain, mounted within a Corian counter. Toilet is both electric and manual. Head is well-designed for extended time onboard and has good ventilation and natural light. The salon is charming and is a place that invites you to cozy up to a book or just hang out. There is a settee to starboard with opposing dinette-style seating to port. On the bulkhead forward of the dinette, there is a custom wine cabinet. The salon table is hinged to the bottom of this cabinet, allowing it to be swung up and housed behind the cabinet’s louvered doors. Further, the dinette converts to a double berth by using a transom berth sliding panel. When the table is in its up position, the dinette area is an open area for lounging. Dinette and settee cushions and bolsters are upholstered with lovely deep green Ultrasuede. Ports are opening stainless steel ports with stainless screens. To starboard and across from the dinette and at the aft end of the settee is the nav station. Nav station has all the electronics one needs and more. There are two electrical panels; both are close at hand and are hinged for easy access to the wiring behind. The aft cabin is to starboard, adjacent and aft of the companionway. The berth is a generous single and there are custom stowage compartments adjacent to the berth and below the cockpit that have the capacity to stow a truly unusual amount of equipment and personal gear. Lastly, COFRESI’S CHILD has an amazing U-shaped galley. It’s located to port, adjacent to the companionway and in the aft quarter of the salon, and it’s so well-conceived, it makes you want to cook and, more importantly, invites you do it while underway. The Force 10 stove with oven is gimbaled, the refrigerator/freezer has six inch insulation, and counter space and storage lockers are amazing. Further, COFRESI’S CHILD has a custom pantry locker across from the galley. The galley, as with so many custom features, make COFRESI’S CHILD particularly well suited for spending extended time aboard. One of the nicest galleys you will find in a boat of her size. Galley is aft and to port of the companionway steps, ideal for serving food in the cockpit. Elegant touches everywhere, all the way down to the light in the refrigerator. Exceptional counter space, and countertops are off-white Corian. COFRESI'S CHILD has been maintained to feel like a new boat. All manuals, instructions, diagrams for electrical, wiring terminal block list, plumbing and operation convey. Complete documentation. Spares parts kits for engine, alternator, water maker. Original check-sheet for vessel commissioning. Chuck Paine created the design with the live-aboard cruising couple in mind. The sail plan was designed for easy sail handling, and the rig is friendly for the Intracoastal Waterway bridges with its 61-foot height. 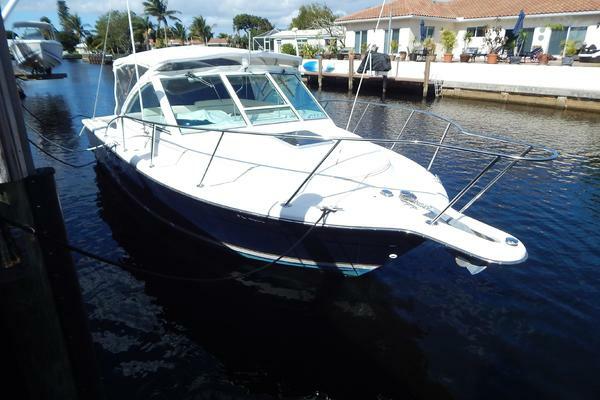 The boat’s modest 5'-6" draft is perfect for the ICW, Bahamas, Keys and Chesapeake Bay. The cutter rig with dual roller furling makes the sail size all the more manageable. The double spreader rig is well stayed with fore and aft lowers, and the mast is keel-stepped, using an elevated mast step so bottom of mast base is above any bilge water. Sail area = 1,134 sq. ft.
COFRESI’S CHILD’s builder, Cabo Rico, is famous for the quality of its construction and for its solid glass hull construction. Structural bulkheads are all glassed in to provide strength and stiffness. The hull-to-deck joint is a raised bulwark design that creates a large channel structure around the entire vessel, which makes the boat even stronger. The joint is sealed with 5200 and thru-bolted. The bulwark design has the added benefit of providing a vertical platform for attaching lifeline stanchions which is stronger and less likely to ever leak. 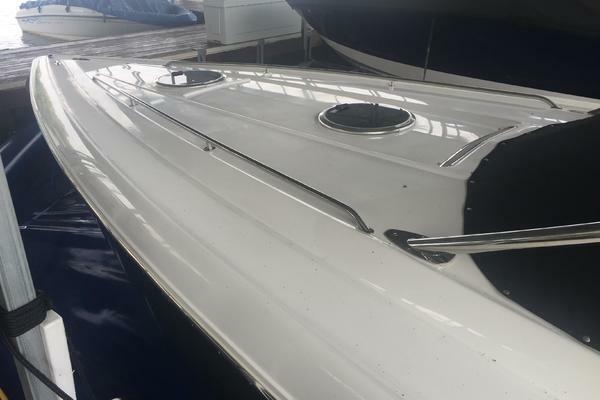 The solid teak and holly sole is attached with epoxy glue, and there is no area of the bilges and substructure that leaves wood exposed to the elements. There is a complete grounding system using heavy industrial wire and connections and a totally encased keel ballast. The deck design offers secure bulwarks as an added safety factor. The mainsheet traveler is out of the cockpit forward of the dodger, so it does not interfere with those in the cockpit. The cockpit is deep and secure, with a bridge deck. The deck handrails and high lifelines provide real security going forward. Boarding gates amid ships, port and stbd.